By now, you all know that I enjoy myriad international cuisines. When you consider each cuisine individually, it has its own personality comprised of distinctive tastes, often driven by a strongly-associated ingredient: kaffir lime in Thai food; saffron in Persian dishes; paprika in Hungarian goulashes and stews; cardamom in Indian curries; cumin in Middle Eastern cuisine; and tomatoes in an Italian ragù. Sometimes, they are native to the regions in which they are famous - kaffir limes to Southeast Asia, cardamom to South Asia, and cumin to the Levant (the crescent of countries at the east end of the Mediterranean). However, where would Persia be without saffron? Hungary without paprika? Italy with no tomatoes? Yikes! Can you imagine? Saffron is native to Crete, paprika (capsicum) to the Americas, and tomatoes to Central America. How grateful we are to those who carried these wonderful flavors across borders! As I read through the recipe, it really intrigued me for its list of cross-cultural ingredients. 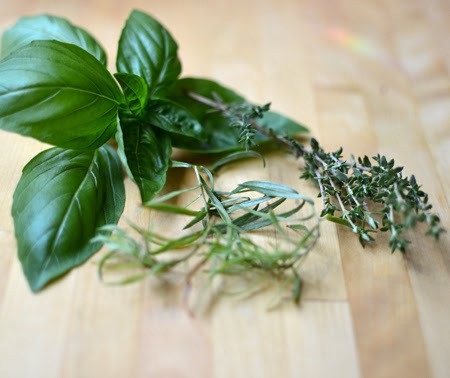 It started out with the standard basil and thyme, but then added tarragon for a licorice note. That in itself was different but just after the tarragon came the real surprises: star anise and cloves! The flavor of the dish was subtle, and so different from any other pasta sauce I have had. I have made it several times since, increasing the spices a bit and using red grape tomatoes when I couldn't find Sun Golds. It is really good and worth trying. I love when flavors combine like this - crossing borders after centuries of trade. Fusion, right? After all, when you consider how much of what we eat is actually native to where we live, we are all eating across the border every day. P.S. - Sorry, Italy; basil isn't native to Italy, either - it comes from South Asia! Heat oil in a large skillet over medium heat. 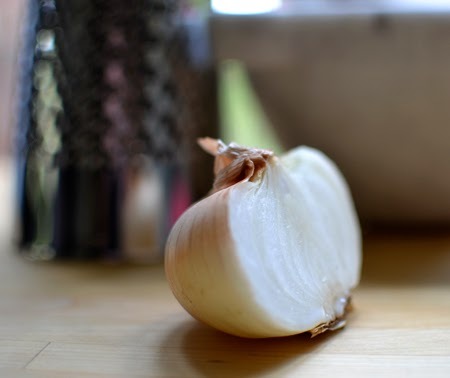 Add onion and cook, stirring often, until soft but not brown, 6-8 minutes. Add basil, thyme, and tarragon sprigs, star anise, and clove, and cook, stirring often, until fragrant, about 3 minutes. Add tomatoes and vinegar. Cook, stirring occasionally, until tomatoes release their juices and a sauce forms, 10-15 minutes. Discard thyme, tarragon, and basil sprigs, star anise, and clove. Season sauce with salt and pepper. Meanwhile, cook spaghetti in a large pot of boiling, well-salted water, stirring occasionally, until al dente. 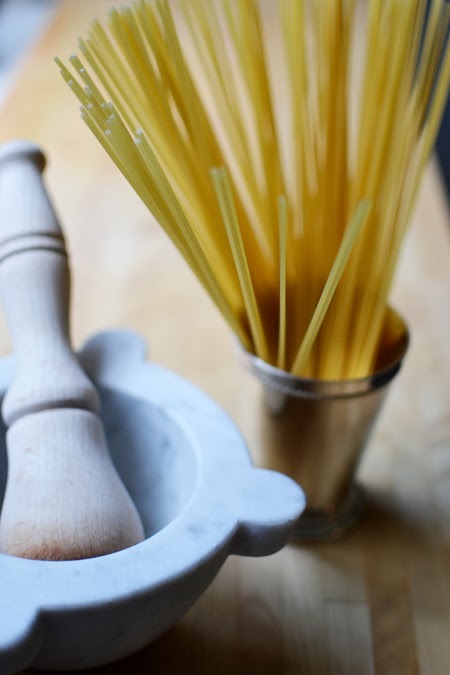 Drain, reserving 1 cup pasta cooking liquid. 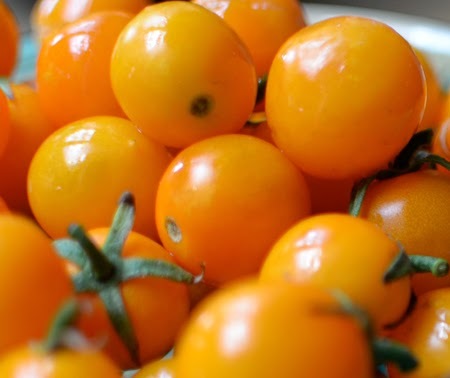 * If you cannot find Sun Gold tomatoes, use red grape or cherry tomatoes. Wow! So beautifully vibrant, and sounds delicious! I agree with you about Bon Appetit. Used to be my favorite magazine (I have boxes and boxes of old issues dating back to the early 90's). I stopped my subscription a couple of years ago, after they changed their format. Now my favorite is Fine Cooking. :) Your photos are just beautiful! Thanks, Cathleen, for your kind comments on my photos! I am glad to know I an not alone in my feelings for BA! My absolute favorite - La Cucina Italaina - was just discontinued and I am so sad. My current favs are Saveur and Fine Cooking! Dear David, what amazing pictures of this humble sounding recipe - the colors are just fantastic. 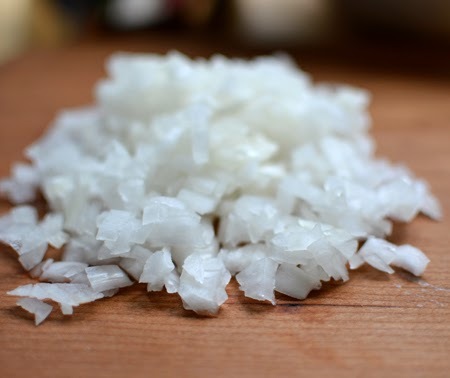 And I love your idea behind this post - so many ingredients hails from so many different places around the world - how lucky we are that we can get a lot of them at the specialty stores. Is it bad that I still have a subscription to BA - even after they changed their format...I feel a certain kind of obligation towards them and I still like leafing through the magazine...sorry about that...but I do read a LOT of other magazines. Wir wünschen euch ein schönes Wochenende, mein Freund! I laughed out loud when I read your comment, Andrea! No, it isn't bad that you still are loyal to BA! You are younger than I and it probably works well with younger minds! :) Mark and I have been working on a book on this subject - where our foods come from. Maybe someday it will be finished and published! Liebe Grüße, meine Freundin! What in intriguing collection of flavours. I always associate star anise to Asian food and would never think to pair it with tomatoes and basil. I know, John - very unusual, but very good! Wow, those definitely are different flavors in a pasta recipe. 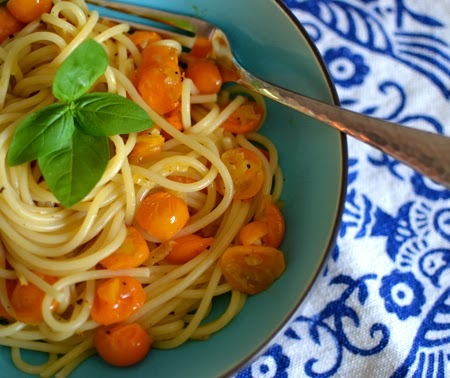 Being Italian, I wouldn't be brave enough to make this dish (especially since I really dislike cloves in any dish-inherited this from both my parents...I wonder if it's the same as the cilantro thing: it's in the genes!) but your photos are, as usual, phenomenal! Christina - happily I can read Italian (and speak a bit, too) and I have been getting the online version of La Cucina Italiana for a couple of years. But the English language version was read different and I was so relieved when they changed the format to show off more authentic Italian food instead of the ersatz Italian-American restaurant recipes. I will really miss it! So funny that you don't like cloves. Come to think of it, I cannot think of an Italian recipe that calls for cloves. We have Chiode di Garafano fragrance (from the Farmacia Di Santa Maria Novello) and love that. 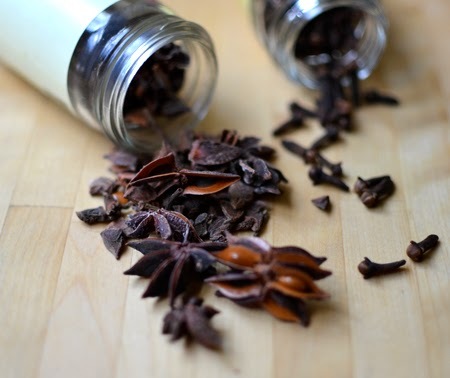 The star anise was much more prevalent - maybe you could try it without the cloves? Wow, what an interesting recipe… and so fresh and delicious! Love it! That is exactly why I love this recipe, Liz! It reminds me of some of yours! That's so very kind, thank you! I will definitely be making that this summer! It is almost tomato season here now! "Markapedia"! I love it and miss you both. Hoping I can grow these beautiful, gold tomatoes as I surely won't find them on the fruit & veg truck that comes to the ranch. 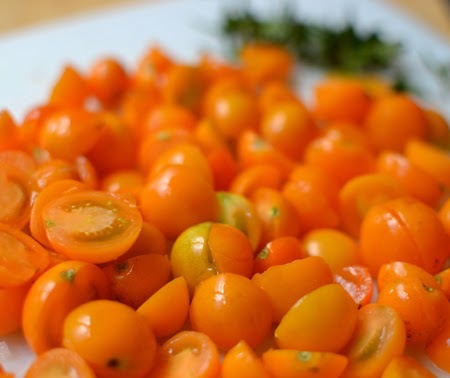 Holly - a lot of the Sun Gold tomatoes here come from northern México. Maybe they will make it down to you someday. Miss you guys, too. Will make it down there someday! I haven't picked up at a BA in years, so in not familiar with the new format. They used to be my favourite and I still have boxes on back issues. But after a while they just got boring and there were nothing but pages of advertisements and very few articles and recipes. I get Saveur on my iPad and I love BBC Good Food. Aah, the spice trade, what a wonderful idea! Where would we be without spices? I couldn't live without my cardamom! I am glad you like the recipe, Nazneen! The flavor combos are pretty amazing... I can't imagine my life without most spices, as very few are from the Americas! What a fresh sounding sauce, love the spice combination, bet this is a real stunner. Thanks, Cheri! 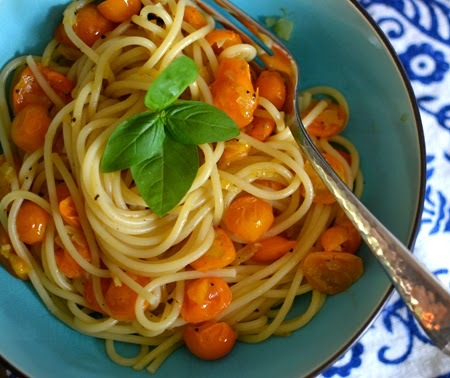 It is one of the prettiest pastas I have made! I didn't know that about basil actually! Thanks, Fiona - I will definitely read Ruth's post. I am so grateful for those explorers that blurred all the culinary borders. I cannot imagine my beloved Italian food without tomatoes, or Thai food without chiles! Thanks for your note! David! I made this for dinner tonight at Kristine's behest and it was amazing! I'm normally not a big fan of anise and tarragon, but the flavors were subtle and worked perfectly with the sweet and tang of the tomatoes. This was just fantastic, and I'll be making it again! Oh, and Kristine thinks it would be better with capellini, but I think the spaghetti is perfect with it (and Eleanor agreed with me). :) Thanks for this great yet simple recipe! Thanks, Kevin! I am so glad you liked it and am glad Kristine convinced you to make it. 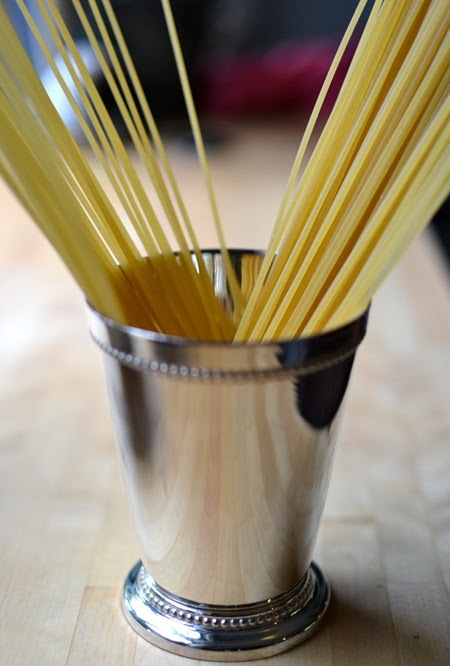 I still think the spaghetti is perfect for it, but would be willing to try it with capellini because, hey, I have been wrong before! This is a fabulous post, David. You know cross-cultural cuisines are close to my heart and this recipe (and your beautiful intro) are no exception. The cloves are my favorite addition here. Thanks, Yasmeen.I really do think these flavors are a wonderful - if unexpected - combination. 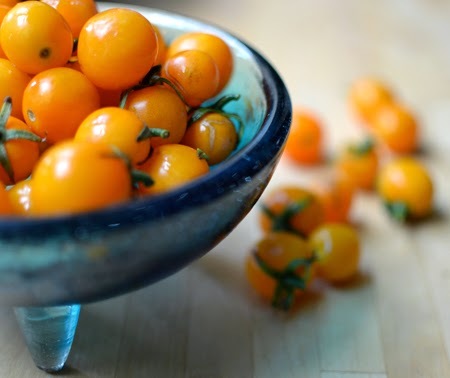 I will have to try the recipe this summer when we will have sun gold tomatoes from the garden. The sauce has such an interesting and different combination of flavors. Karen - you are so lucky to be able to grow Sun Golds there - I have been looking for seeds or a starter plant and haven't found one. But I will keep trying...I hope you enjoy the pasta! Thanks, Colette! I did, as well! I totally agree about Bon Appetit. I'm also losing interest in the elitist approach Food & Wine has adopted. I do still enjoy Fine Cooking, though. We'll have to try this recipe - our Sungold tomato plant is flowering just now! Thanks, Susan! It has begun to occur to me that, with all the amazing food blogs out there, magazines must be having a harder and harder time making it. I think we foodies will still subscribe, but many people I know just start a search for a recipe and end up using blogs. Hope you and John get a great crop of Sun Golds! Thank you, Catherine - so nice to have you visit C&L! I think we can all feel truly blessed with the amount of fresh vegetables and fruit we have available to us! It helps us make these great dishes! You are so sweet, Laura - sometimes I am lucky with the photos! :) I think the U.S. is very much like Australia in that regard - one big melting pot of international flavors. It is great fun!